When Joel and Olivia sit down to dinner, with two of their favourite dinosaurs, Olivia can’t help but point out that her dinosaur is better. After all, her dinosaur can play the trumpet while riding a bike and its house is in the shape of a rabbit. It can make jam and even eats electric eels. But, Joel’s dinosaur can swim like a shark and has teeth that glow in the dark. It can jump and slide on its knees, has x-ray vision and isn’t afraid of bees. It’s hard to say which one is the best. Things get trickier when another dinosaur joins them at the dinner table – one that once ate a volcano and wears slippers the colour of rainbows. How can Joel and Olivia’s dinosaurs compete with that? 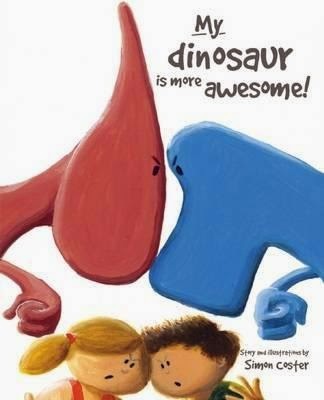 My Dinosaur is More Awesome is the first book from English artist Simon Coster. This is an enjoyable and fun book about the competitive nature of siblings Joel and Olivia; each one building up the magnificence of their dinosaur. When things reach unbelievable heights, Mum steps in and not only settles the argument but trumps them both with the awesomeness of her own dinosaur. The story is told in rhyme and is easy to read, making it a great read-aloud book for pre-schoolers or very early primary children. The one upmanship that occurs between the two children is silly, imaginative and will really appeal to the target readers (and also ring true to those parents who have witnessed similar ‘stoushes’ between their own children). The illustrations, mostly on white backgrounds, are bold and colourful. They have a cartoon-like quality to them and really showcase all the fanciful activities for the dinosaurs are claimed to get up to. Simon Coster is a mostly self-taught artist who loves to experiment with different style and genres. Although he paints mainly for recreation, he has been exhibited and sold. My Dinosaur is More Awesome is his first children’s book and was chosen as a main selection for July 2015 by the Children’s Book of the Month Club. He lives in Lincolnshire UK with his wife and children.